Soaring pine trees scenting the morning air, majestic mountains reflecting in deep blue waters, old-fashioned wooden boats serenely floating around – standing on the shore of Lake Braies for the first time, it felt as if I was looking at a grand en plein air painting. The forest frames the view into a perfect composition, and when the light is right, the landscape ranges in color from every shade of green, turquoise and blue. You’d think only an artist could ever envision such an image, but then again, who’s better at wielding the paintbrush than Mother Nature? I could definitely go on yapping about every inch of this place for days, but honestly pictures can do a much better job than my words. Besides, if you’re reading this, chances are you have already stumbled into one of those spectacular snaps online and have smartly added a visit to Lake Braies to your bucket list. Well, guess what? I’m here to help you check this item off right away. 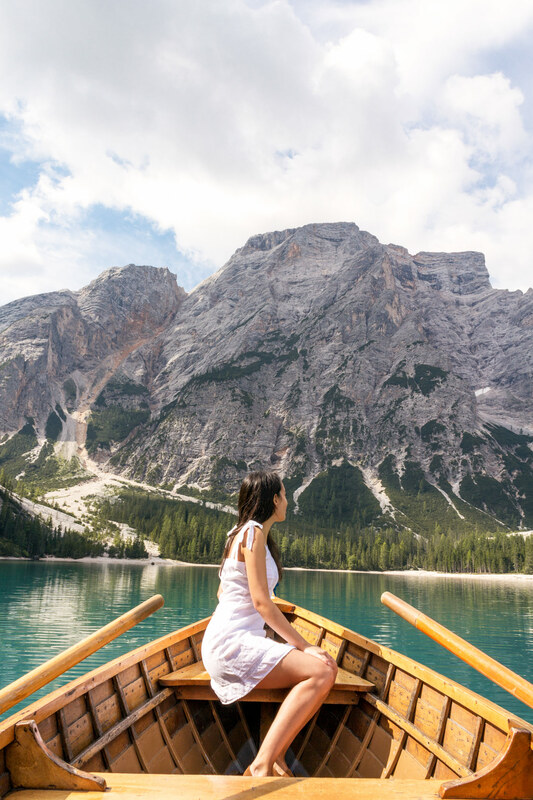 Scroll down to find the ultimate Lake Braies travel guide, with tips on how to get to there, where to stay, and, as the cherry on top, a list of activities you can enjoy – you know, besides taking those Instagram-worthy pictures! WHERE IS LAKE BRAIES LOCATED? Lake Braies is located in Northern Italy, around 100 km from Bolzano. 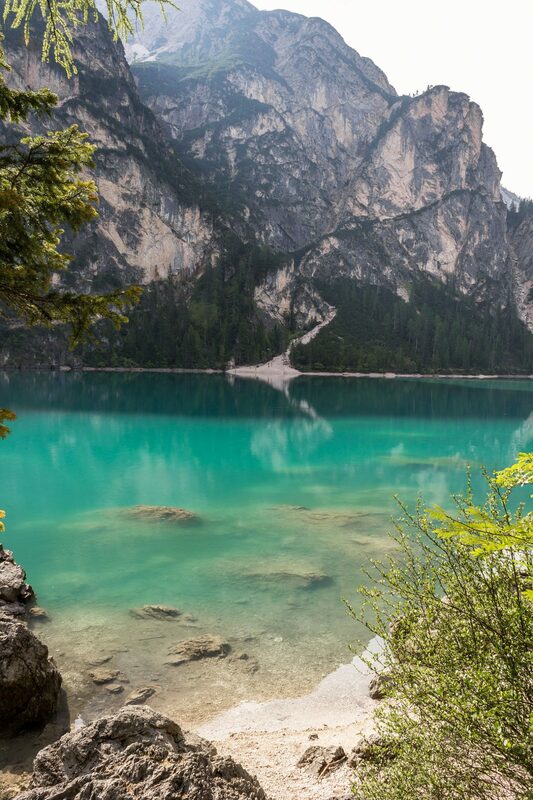 The lake and its surrounding are part of the Fanes Sennes Braies Nature Park – a gorgeous natural reserve in the Dolomites – and the imposing rocky wall that is reflected in the deep turquoise waters is called Croda del Becco, or Seekofel, in German. Besides being one of the most beautiful lakes you can find in the Dolomites, Lake Braies is also the largest one. You may stumble upon travel guides calling this lake with a different name, i.e. Pragser Wildsee. Don’t panic! This is simply the lake’s German name. Due to the fact that, until 1919, South Tyrol used to belong to Austria and was inhabited by almost 90% German speakers, both German and Italian are currently spoken in the area, so you’ll find everything written in both languages. Fascinating, isn’t it? It’s not the ideal option, but it is possible to get to Lake Braies by train in the summer. The nearest railway station is Niederdorf (Villabassa), and is served by trains departing from Milan (5h), Verona (3 ½ h), Padua (4h) and Venice (5h). You can check all your options here. Between the 20th of June and 20th of September, there is a regular bus service (bus number 442) that departs from Niederdorf railway station and will take you all the way to Lake Braies. If you’re flying to Italy, note that there are no international airports near Braies, but you can fly to Venice and get a direct Flixbus transfer from the airport to Dobbiaco station – the central bus station in the Dolomites. Bus 442 stops also in Dobbiaco. The total journey by public transport from Venice to Lago di Braies is approximately 4.5 hours. Bus 442 leaves the station every 30 minutes and costs 3 euro. You can check the 2019 updated timetable here. 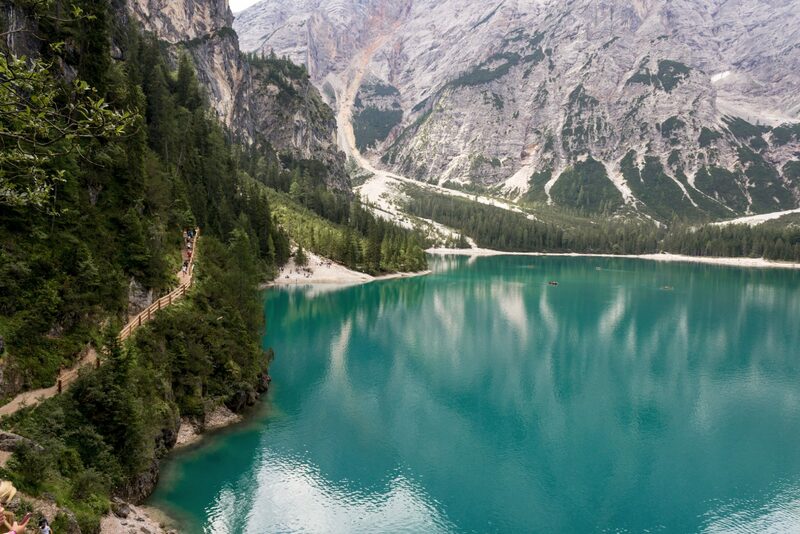 The easiest (and most fun) way to get to Lake Braies is, of course, by car. Renting a car will not only get you to your desired destination, but it will allow you to explore everything this area has to offer on your own schedule. The national road that leads to the lake is the SS49 and is connected to all the major highways. Note that if you come to Lake Braies by car, you have to pay for the parking space. It’s 2 euros for the day if you arrive before 7am, 6-8 euro if you arrive between 7am – 5pm and 4 euro after 5pm. If you want to stay as close as possible to the lake, the Hotel Pragser Wildsee is hands down the best option. This nineteenth century hotel is located right in front of the lake and the view from its rooms is EPIC. Side note: if you’d like to stay in Pragser Wildsee, you need to hurry the hell up, as their rooms are often all booked up even 6 months in advance! Anyhow, most visitors choose to stay in one of the many charming hotels available in Valdaora. There’s plenty of choice for all budgets and the landscape is just as marvelous. The Braies valley boasts 34 spectacular hikes, all of varying difficulty. The most popular route is the one that goes around the lake and is approximately 4 kilometers long. It takes only 1.5-2 hours to complete this route and it’s rather easy, but it does involve going up and down a large number of stairs. But hey, gotta burn off those strudels somehow! You can find all the routes and details here. There’s nothing like sitting in an old wooden rowing boat and stroking through the still waters. A little boat of your own will give you the chance of admiring the mountains from a completely different perspective. Besides, what’s the point of all those workouts if you can’t impress your buddies in a situation like this? Just grab your paddle, hop in, and go! Well, you could also just relax and let someone else do all the hard work you! The booth is open daily from June to September, from 10 am to 5 pm. 1/2 hour costs €15.00, while 1 hour costs € 25.00. You may also be tempted to take the plunge into the lake’s blue water, but let me warn you, the maximum temperature is around 14°C – super fudging cold! The charming little chapel that you can spot along the shore is the Lake Braies Chapel. It was built in 1904 as the private chapel of the Hellensteiner family, owner of the Pragser Wildsee Hotel. The overall location of the chapel is lovely, but you should also know that this place has been witness of a great deal of history. 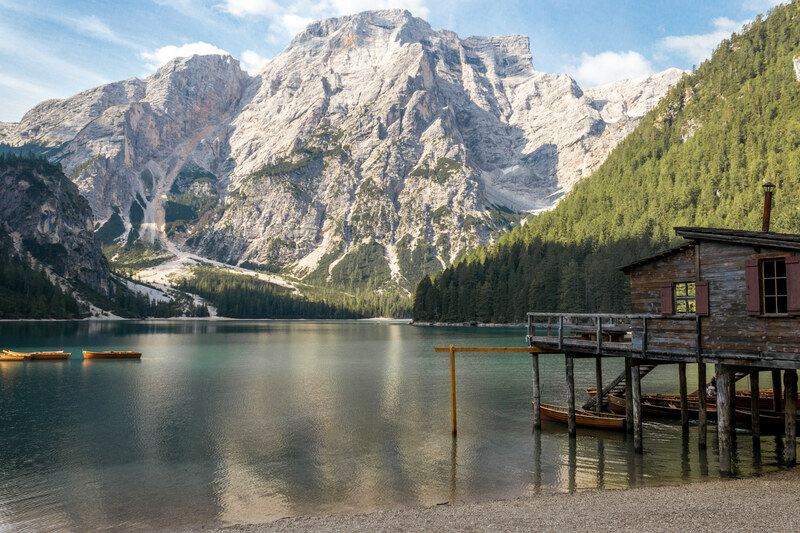 In 1945, at the end of World War II, 137 prisoners of the Dachau concentration camps were taken to Lake Braies under the order of the SS commander in chief, who planned to exchange them for his safety. Luckily, the prisoners were indeed liberated, and immediately after the exchange they all went to the Lake Braies chapel to rest. To this day you can find a plaque on the wall of the chapel that commemorates the event. The Hotel Pragser Wildsee dates back all the way to 1899, and the historical episode I just told about took place right in front of its entrance. Once the prisoners were liberated, the owner of the hotel, Emma Heiss-Hellenstainer, welcomed them and helped them gain their strength back. Feeling a little tired from all that hiking? Head over to Hotel Pragser Wildsee for a nice lunch! You’ll have the chance to taste some good old Tyrolean cuisine while learning about the past through the memorabilia around you. Besides, their outdoor seating is gorgeous and you’ll have the best view in the area. The Dolomites are pretty much a climber’s paradise. Around Lake Braies you can find both fixed rope route (via ferratas) and climbing crag to practice your skills. 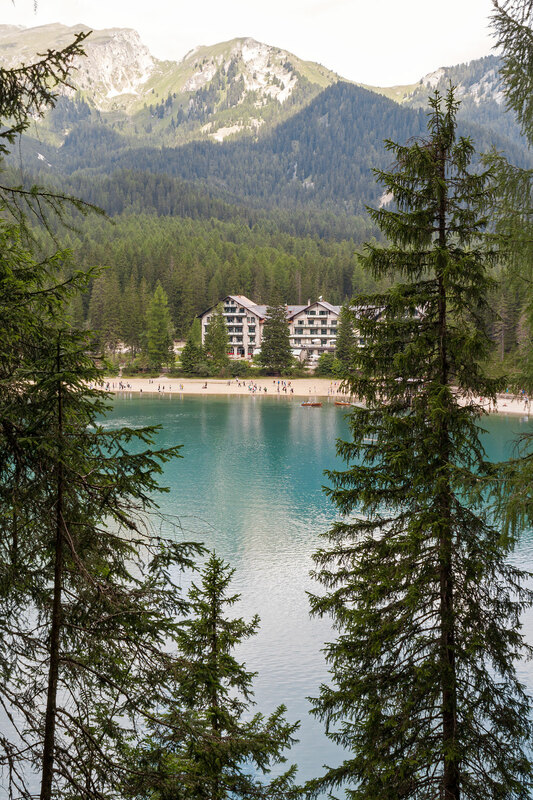 There’s also a huge climbing garden with 15 different tracks in the area, and it’s just a 30-minute walk from Lake Braies. If you’re looking for something more challenging, you can climb the popular via ferrata called Cima dei Colli Alti – it starts near the shore and takes around 6 hours to complete. No matter the weather you’ll find, or the angle you choose, your photos will look absolutely phe-no-me-nal. WHAT IS THE BEST TIME TO VISIT LAKE BRAIES? Honestly, Lake Braies is guaranteed to take your breath away no matter when you visit. However, for most activities, I’d recommend going there during spring or summer. If hikes, casual walks, scenery and pleasant weather is what you’re looking for, I would say the best time to visit the lake is from late June to mid-September, when the average highs are from 16 to 23°C. Nevertheless, many visitors may prefer the winter due to the various skiing activities popular in Lake Braies around that time. Also, the frozen lake and the snow-covered Dolomites are really something to see! Unless you’re planning on having lunch at the Hotel Pragser Wildsee, I suggest bringing your own food and water (but please don’t be an a-hole and remember to take all waste with you). Other than that, bring your best camera and soak it all in! Relatively unknown to most until a few years ago, Lake Braies can really pull a big crowd these days. What most pictures don’t show you is that the main shore is usually PACKED with tourists. P A C K E D. And when the buses arrive, it’s even difficult to get through the route around the lake. For this reason, I highly suggest going there in the early morning, even at sunrise if you’re up for it, when you’ll have most of the lake all to yourself – but honestly, Lake Braies is a lovely sight even with the crowds! 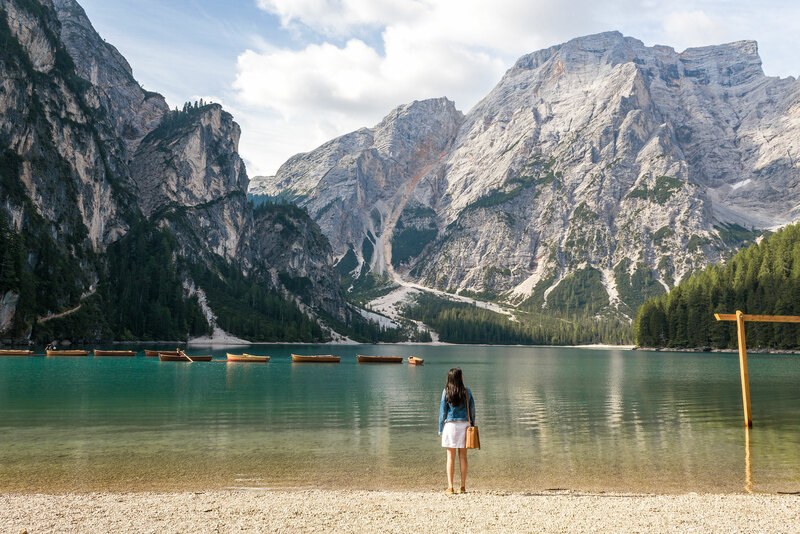 Are you planning on visiting Lake Braies? Let me know about your trip!